We’ve all heard horror stories about a trade that went bad for one of the participants. The complaint originates when said trade didn’t have the end-result half of the parties involved had hoped. It seems there’s always a glitch that rears its ugly head when the car finally gets home. However, like anything else, there are times it works out well. The following story reminds us there are good deals out there, you just have to find them. Gasser! Not really. Even though it looks the part, the engine powering this beast is a 1977 Buick V6! Our recollection begins when my brother, Dan, and I, bought a 1952 Willys after a neighbor announced he was going to crush it. We then built the car into what we called a joke car. Under the hood, was a Buick V6 with a 200R4 transmission behind it – certainly not gasser material. To add to the joke, a few fake items were used. For instance, the Moon-style tank wasn’t a real one, nor was it hooked up to anything. Unfinished as the Impala was, the first thing removed was the Candy Red paint. A set of white headers were simply bolted to the inner panels, the tach on the dash wasn’t wired, and the huge scoop on the hood did nothing but block the view from the driver’s seat. With the exception of paint and upholstery we did the majority of the work in my back-yard garage. The car was built in 18 months, and finished in June 2016, just in time to take it to the NSRA Rocky Mountain Nats in Pueblo. Four months after the gasser debuted, Dan saw an online ad posted by Chuck Kumalla of Marion, Ohio, announcing he wanting to trade his partially built ’63 Impala SS for something. Dan contacted Chuck, offered the Willys, and a serious conversation ensued. Chuck loved the Willys, and even said it was his favorite color – orange. Dan learned Chuck had been working on the Impala over a six year period, but had yet to drive it because it lacked glass, interior, and paint. Dan gives credit to Chuck for the majority of the build, as he removed the body, had the entire chassis redone and incorporated disc brakes up front. The 427ci big-block engine was rebuilt and had an M21 four-speed behind it, and the driveline ended at the a 3.55-geared Posi rearend. Big-block Chevy engine was built with all the best parts, including Sanderson cast-iron headers. A four-speed resides behind the engine. After two days travel to Ohio, the brothers unloaded the Willys and drove the running Impala into the trailer. Emptying Chuck’s storage shed filled the bed of the Silverado with old and new ’63 Impala parts. On the way home, Dan and I debated how to finish the car, and, as it turned out, there was a bit more work to finishing the car than they first anticipated. But, neither complained, since we are Chevy guys, and in the past, have built a 1960 Chevy Brookwood station wagon just before tackling the Willys, and previous to that, a couple of ’64 Chevys, and a few ‘57’s. The Impala was covered in gray primer, but the door jambs and cowl had been “cut in” with Candy Red. Dan and I planned on a different color, so that was removed. Then, we pulled the fenders, sanded the primer, reprimed them, painted the wheel houses black, and hung them. The grille and headlights were installed, the hood was sanded, reprimed, the underside painted black, and bolted on. We were worried the hood wouldn’t fit since the big-block had a Edelbrock high-rise manifold with a Holley four-barrel carburetor and K&N filter atop it. After some adjusting, there was 3/8-inch clearance. The dash was next. Neither of us are fans of the factory black, so it was sanded and painted Hyundai Copper Beige. The doors were removed, sanded and reprimed, and the jambs were painted Chrysler Mango-Tango. Reproduction parts like the bumpers, cove trim, and taillights abound. After the doors were hung and adjusted, we tackled the rear. The first thing we noticed was that the rear coves were crooked. This happened when the quarter-panel had been installed. The coves were removed and replaced with new ones. Left: Door panels feature SS logos. Right: Console was hand-built and upholstered, and features cup holders. With the trunk lid removed, the trunk floor was scuffed and new spackle paint was sprayed – looks factory now. The trunk lid was sanded, reprimed, and adjusted. The roof was block sanded and reprimed. In April, 2017, the Impala received its final block sanding and was painted base coat/clear coat by good friend, Dave Pareso of Back Street Kustoms in Fountain, Colorado. Dash pad has been trimmed in same vinyl as seats. Tilt column has been added. While the paint was getting buffed, the buckets and rear seat were sent out for upholstery. I am a retired graphic artist, and designed the interior. Carlos Bahena of CB Auto Interiors of Aurora, followed the design with a combination of Cayenne and Cashew vinyl, along with Fusion Cabernet fabric for the inserts. The door panels feature the SS logo, and the headliner was made of the same Cayenne vinyl. Loop carpet was ordered in a matching color. The two SS consoles that came with the car were sold, and a new one was built. That console was upholstered in the Cashew vinyl, while the inserts were painted dash color. A tilt column was painted dash color, and a ’64 Impala steering wheel was attached. Finally, the car went to the glass shop for windshield and back light. In July, 2017, Chuck came to Denver to take a test drive. 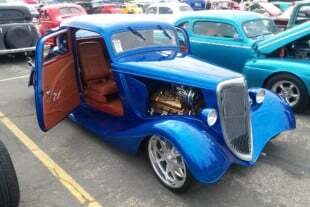 He mentioned he’d taken the ’52 Willys to its first car event in April, 2017, and won DJ’s Choice (in the months since, he’s won nine more awards with the Willys). Shortly after Chuck came to Denver for his test drive, Dan and I started taking the Impala to local cruises and started another project. Some trades don’t work out exactly the way they should, but when they do, both parties end up with something they really wanted. Chuck’s happy with the trade and so is Dan. The 1963 Impala SS – Sultry or Subtle?